Holiday Marina is a 5 star campsite located in Grimaud in the Cote d’Azur region of France. Holiday Marina is a small, modern campsite which is located at the edge of a wonderful marina and on the banks of the Giscle river, a short distance from the picturesque town of Port Grimaud, in the south of France. Although fairly small, Holiday Marina campsite offers a surprisingly good range of facilities and activities both on-site and nearby to ensure you have a really fabulous holiday. The exceptional setting of the campsite means that you can easily take a trip down the river which takes you out into the bay of St Tropez. Here you can visit a variety off different locations with ease. One of the great things about the campsite is its stunning location. The nearest beach is a mere 900m away, making for a wonderful day at the seaside and the towns of St Tropez and Port Grimaud offer the perfect opportunity for a spot of shopping or relaxing in one of the local restaurants, cafes or bars. The swimming pool complex at Holiday Marina campsite is great for younger children with a family pool and children’s pool with a variety of animal sculptures and small children’s slides. 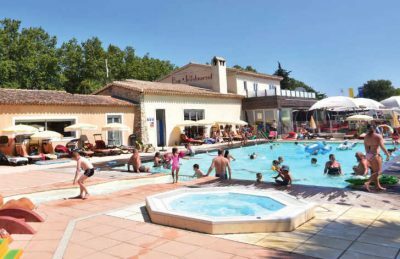 You’ll also discover that the campsite boasts a lovely sun terrace surrounding the pool which offers you the perfect place to lie out in the sun and relax whilst the kids are splashing around in the pool. Holiday Marina campsite offers a comprehensive selection of activities and facilities on site and also nearby to ensure you have a fantastic family holiday. On-site activities at Holiday Marina campsite include table tennis, tennis, football, basketball, badminton, running track, fishing, boules, playground and cycle hire. Facilities available at Holiday Marina campsite include WIFI, restaurant, takeaway, bar, groceries, animation team, games room, washers and dryers. Accommodation at Holiday Marina campsite includes a range of 2 and 3 bedroom mobile homes that are available from Eurocamp.